Pendragon PLC is the leading online automotive retailer, operating over 220 franchised and used car dealerships and service centres nationwide, working with exciting brands from Ferrari to Ford. Our motor car businesses operate under the brands of Evans Halshaw and Stratstone, whilst we also have a presence in the USA with dealerships based in Southern California, under the Hornburg brand. Our other businesses include Pendragon Vehicle Management, providing corporate contract hire with over 30 years of experience, Quickco, the UK’s largest genuine parts distributor and Pinewood, our innovative international software provider. A career at Pendragon offers the chance to work with inspirational brands and pioneering products, in a dynamic and exhilarating environment. Our Graduate Programmes give you the chance to grow and develop every step of the way, with the opportunity for fast-track leadership development whilst earning up to £30,000 with a company car. The only limit to how far you go and how fast you get there will be your own ambition and ability. So, if you’re up for the challenge, get ready to take control of your career and start your journey with us today. Please apply to the latest Pendragon jobs on graduatejobs.com. Do you sponsor non-EEA applications? Unfortunately, we’re not able to offer sponsorship for our Graduate Scheme. If you are applying, you must be able to demonstrate your right to live and work in the UK on a full-time basis. The UK Border Agency can offer you more advice about working in the UK as a non-EEU national. If you’re successful in reaching the assessment centre, you’ll need to provide your original passport, or other original documentation proving your eligibility to work in the UK. What will the online application involve? When you click to apply, you’ll be asked to complete a couple of very short questionnaires to capture your skill set and ensure you meet the minimum requirements of the graduate scheme. You’ll then complete an online application form. If you’re successful at this stage, we'll invite you to complete some behavioural testing. We hold various Graduate Inductions throughout the year. The available dates would be discussed with you at offer stage. What degree level and discipline do I need to apply for the graduate scheme? You’ll need a 2:2 or above and we’ll accept any discipline. Are there any other minimum requirements to apply? You’ll need a full valid EU driving licence and previous work experience under your belt is essential. It doesn’t have to be selling cars, just experience of working with customers. How long is the graduate scheme? 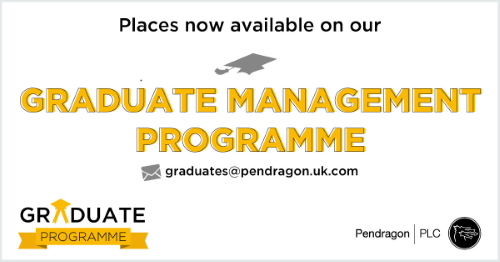 This is an incredibly clear, focused and purposeful Graduate Programme which is split up into three stages. You’ll be reviewed at each stage and have the opportunity to progress to the next level. We have graduate opportunities available at dealerships across the South East, Yorkshire/Humberside, North East, North West and the Midlands. When you apply online you will be asked to indicate which region you would prefer to be based in. Specific preferences will be discussed at interview stage. Please note it is imperative that you demonstrate flexibility with regards to location as we cannot guarantee which dealership will have the demand for a graduate at any given time. We want to base you in a dealership which will maximize your potential to sell! Can I apply for more than one region? We do not accept multiple applications, so please only select your preferred region. Do you offer relocation support? Yes we do offer financial support. We’ll talk this through with you on a case-by-case basis. We offer a great rewards package including a competitive salary, car and bonus scheme, pension, generous holiday allowances and other added extras such as new/used car purchase deals, childcare vouchers, healthcare cash plan and much, much more! There are various start dates throughout the year for each region. It’s best to keep an eye on our careers website for those all-important closing dates as you wouldn’t want to miss out and early applications are highly recommended. If you do miss one of our start dates, we’ll hold your application and let you know when new dates are available. Do you offer yearlong/summer placements or internships? We offer “year in industry” placements across different business areas. All our opportunities are available on our careers page. With these, you could even find yourself fast-tracked onto one of our graduate schemes. What support is offered to a disabled candidate or those who need adjustments during the recruitment process? We’re committed to removing any unnecessary barriers to the employment of any individual. We recognise that in order to enable everybody to compete on equal terms, some people may have additional requirements. If you are subsequently invited for an interview, please give us details in advance and we’ll do everything we can to help you. When will I find out the status of my application at each stage? As you can imagine we receive hundreds of applications throughout the year, therefore please be aware that it could take us up to three weeks for each stage to be completed. We really appreciate your patience at this time and you will be informed of your application status as soon as possible.